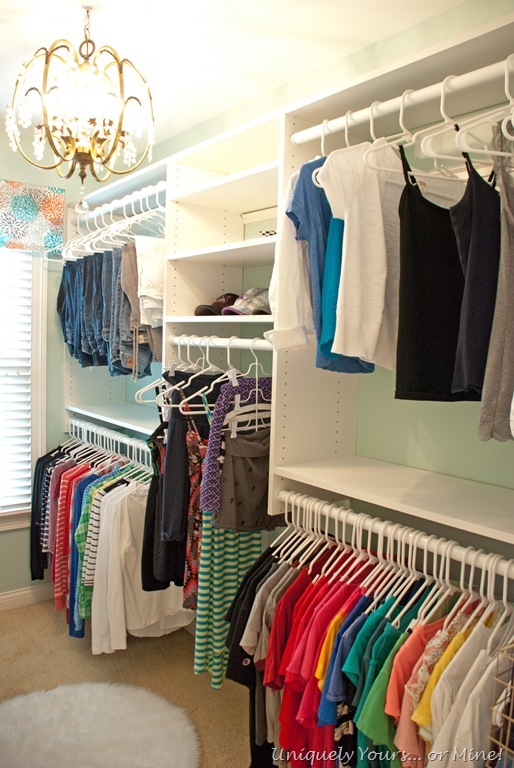 A Total Closet Makeover! – Uniquely Yours… or Mine! WHEW! Brie’s closet is done! And I absolutely ADORE it! If you remember this is what we started with, builder basic closet, original paint from 12 years ago, wire shelving… check out more detailed before information in my post here. This is the beautiful AFTER! The color is Benjamin Moore Galt Blue #CW-560, it looks very Tiffany blue in most light. I’m LOVING the way it is organized with the new closet panels from EasyCloset… and yes the clothes are color coded and sorted by type, it just makes it so much easier to find what you need! She still how plenty of space left for more clothes, not necessary now but you never know! 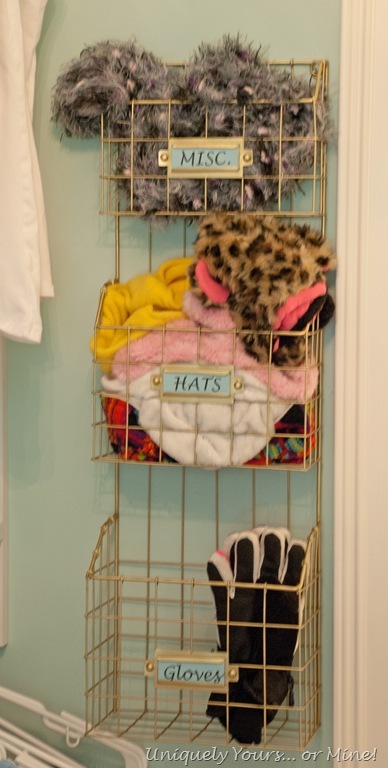 I spray painted this organizer gold to coordinate with the whole color scheme she has going on. My favorite part is this area is for her shoes and accessories! I had this bookcase in storage so I just painted it white and added the grass cloth wallpaper to the back, a pretty easy update! 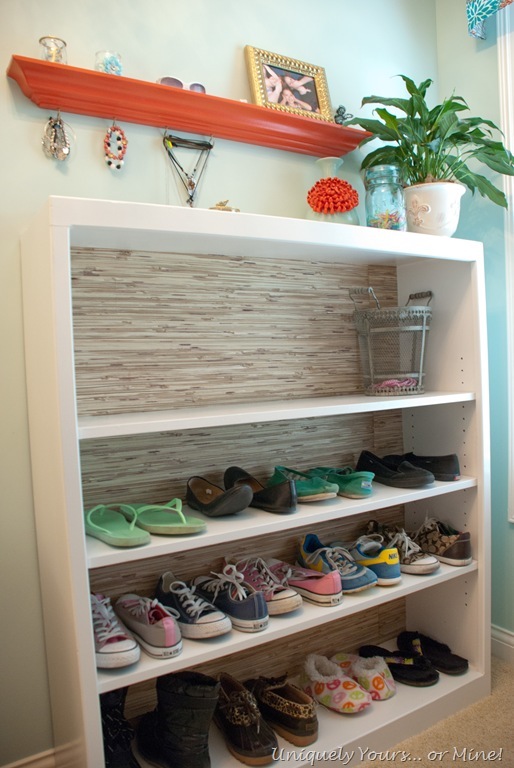 It’s just perfect for her shoes and as you see I can add more shelves when/if she needs more space. The picture rail was also in storage. I color matched the chrysanthemum on the vase to get the perfect coral color, it’s Benjamin Moore Claret Rose # 2008-20. 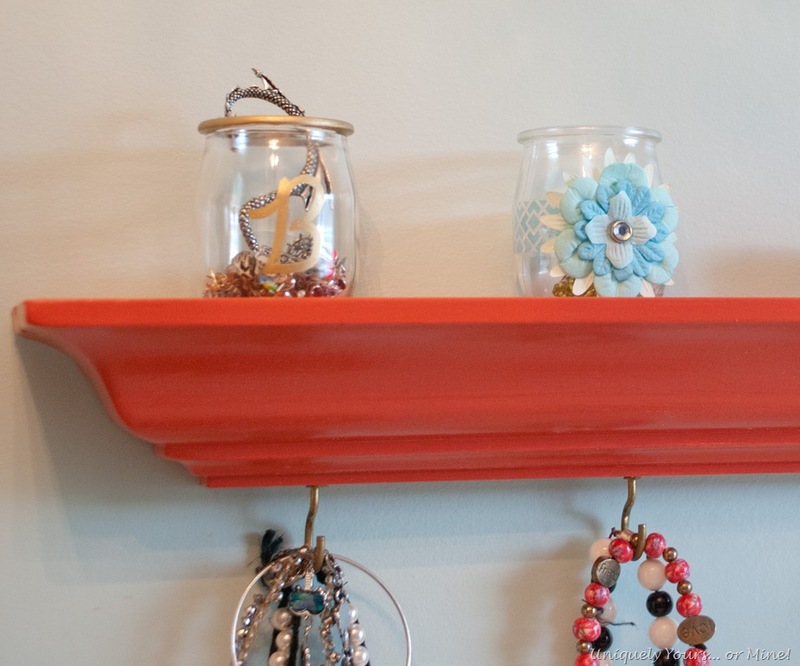 I also added some cup hooks to the bottom to hang her necklaces and bracelets. I added a picture of “the sisters”, this happens to be one of my favorites! My oldest daughter took them to a photographer and surprised me a couple of years ago with Mother’s Day photos! They were clearly having fun with the photo shoot! These are yogurt jars that I just washed out and embellished, so easy and perfect for little earrings and rings! The last thing I did was make this valance for the window. Maybe I should have lined it, but seriously it’s a closet… I think it adds a nice finishing touch! I hope you like Brie’s closet makeover! We are finished painting her room but I am desperately trying to find bedding and a new bed for her… it is NOT going well! Anyway hope to share it with you soon! Brie is hanging with my mom until mid-July so I need to finish everything up by then, I’m hoping she LOVES it! 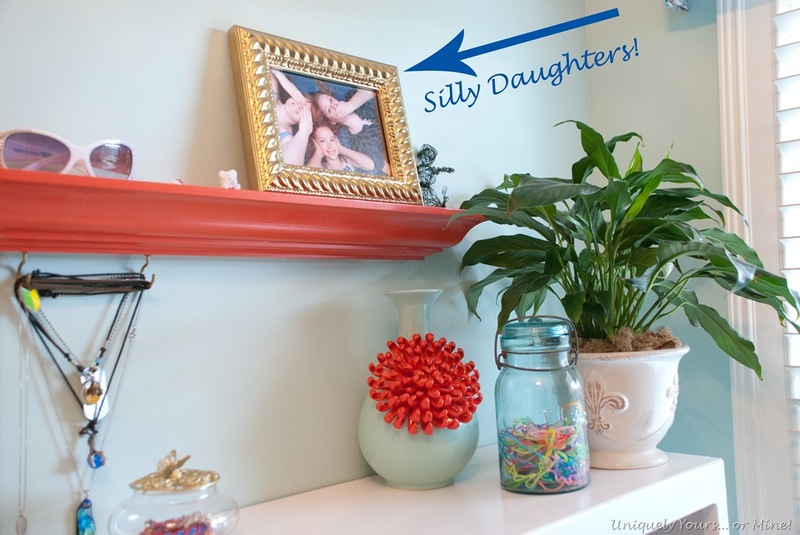 What a cute picture rail / jewelry perch idea. . . And the color! 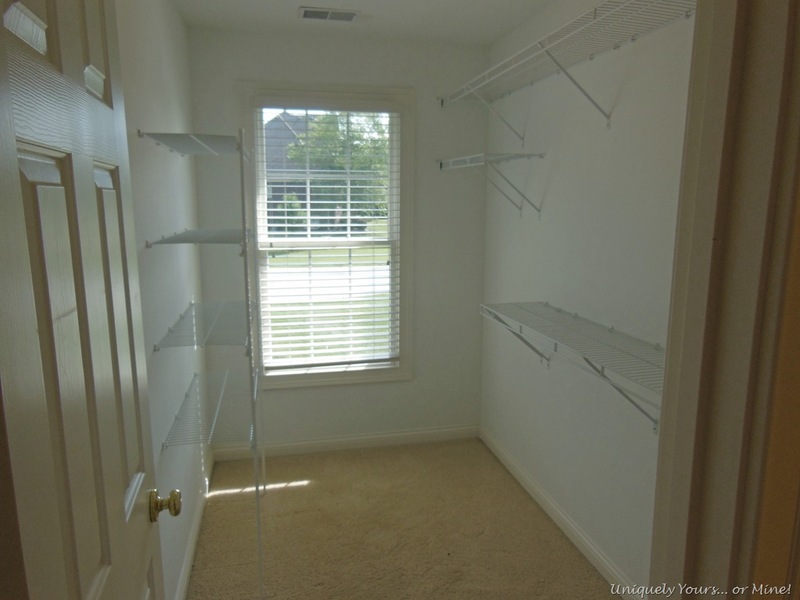 I bet your daughter is very happy with her new storage/closet space. What a beautiful closet you created Susan! I now know how to store all my shoes. Your a fabulous Mom! Thanks so much Hillary! I just hope she likes it! I’m soooo glad I’m not the only one who color-codes clothes! Mine are also organized by season. 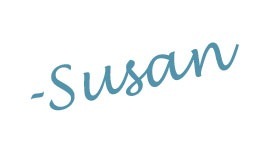 As always, wonderful job Susan! That is one beautiful closet – fun, girly and so well organized! Thanks Sharon, just the look I was going for! Love love love it all. Great job bringing it all together. Where did you find the chandelier?? It’s all beautiful. Thanks so much! The chandelier I bought at auction, it’s vintage and was made in Spain… It’s one of my favorites! Susan, this is such a fun makeover!! There’s nothing better than a pretty and organized space in my book! I love all of your clever ideas and the fun photo! 🙂 Thanks for sharing at Best of the Nest! Thanks so much Pam! 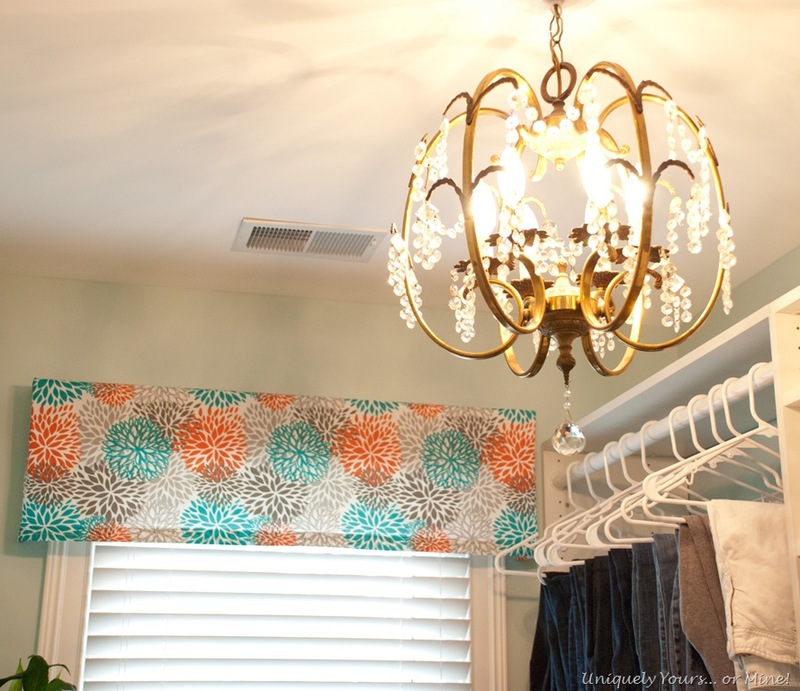 I think a fabulous closet makes getting dressed in the morning so much more fun! Susan what a great space. I would love this room for myself!! So pretty and organized, your daughter is going to love it I’m sure!! Thanks so much Lisa! I’ve given her a sneak peak and she seems excited! Oh wow, I love this. 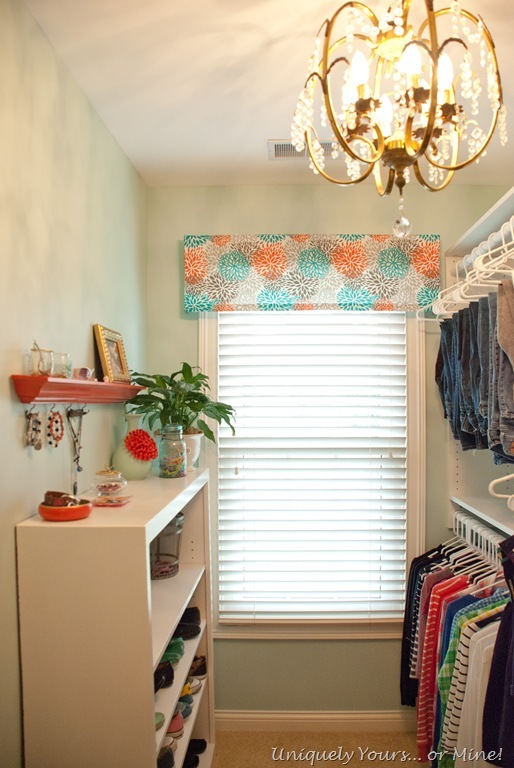 What a bright and cheerful closet and so beautifully redone too. Thanks so much Marty! I certainly think Bries a lucky little girl! no kidding?! this transformation turned out beautiful susan! i would love for you to submit this project over at http://homefor4sweethome.blogspot.com/p/be-featured.html and be my SuperBlogger! Love this! What a great eye for color you have! 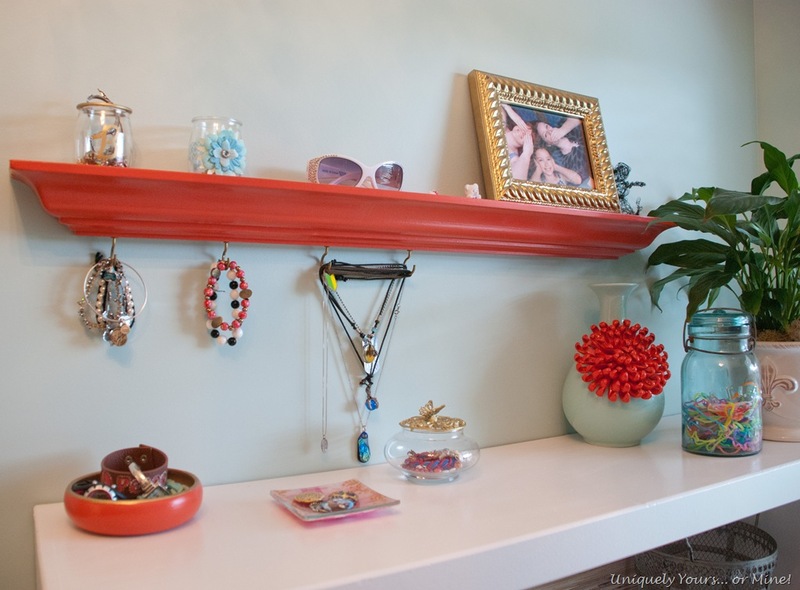 Love the chandelier and the coral shelf, I think I could live in this closet :). Great job. Thanks so much Sandra! I think having the window in there really helps it feel like a room too!